Abby the Librarian: #48HBC Finish Line!! Awoohoo, I've just crossed the finish line for the Sixth Annual 48-Hour Book Challenge!! And about half of The Lost Crown by Sarah Miller. I chose longer books this year and I think I chose very well because I really enjoyed each of the books I completed for the challenge this year. My favorite was Science Fair Season, but Wonderstruck was a close second. 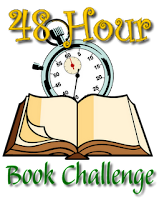 I made my goal of reading for 24 hours and completing 30 challenge hours, but it was definitely a challenge to make that goal! Being able to listen to an audiobook really helped make use of little snippets of time and break up the eye-reading. I made an effort to Tweet and comment on people's blogs, and the social networking aspect of the challenge also helped to break up the reading, although it seemed to me like people were doing less of that in general this year and less blogging during the challenge, too. I didn't choose as many shorter nonfiction titles as I had on hand last year and almost all the books I read were YA or adult, so my book count was lower than it's been before. Thank you, THANK YOU to Pam of MotherReader for a lovely challenge weekend. She puts a LOT of work into organizing this challenge and I look forward to participating in it every year!! And now if you'll excuse me, apparently I've got to read an article in Wall Street Journal that everyone's all upset about. If you're still logging hours, keep up the great work!!!! If you've crossed your finish line, congratulations!